As with any technology driven art form, electronic musicians are often subject to the "imitation vs inspiration" debate: is this music merely variations on earlier works, or the result of hardware upgrades? or is it an ever-evolving method of self-expression, validating for artist and enlightening for audience? 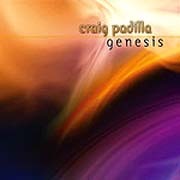 A convincing force for the inspiration argument is Craig Padilla. His sweeping sonic works are personal portrayals of the internal workings of the universe; an attempt to connect the scientific with the spiritual - our inner and outer landscapes. His album Genesis (71'17") is an artful weave of energized, propulsive rhythms, swelling melodies and gorgeous synthesized texture and harmony. With little vertical development, the four pieces advance horizontally across an aural plane of mysterious dark matter and fiery cosmic birth. From the mechanistic patterning of the title track (20'31") to the drifting space and gentle comfort of "Moon Tides" (13'19"), Genesis covers a wonderful range of spacemusic experiences. But as cerebral as this genre is, it is the heart that makes music out of noise. With insightful listening, we become indistinctly conscious of the spirit of this album... the search for the artist in his work.